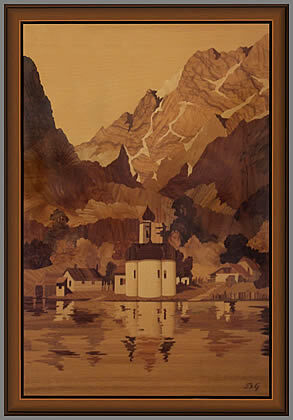 September, brings us some rather unusual and interesting examples of the marquetry work produced by the infamous Buchschmid and Gretaux wood inlay company. 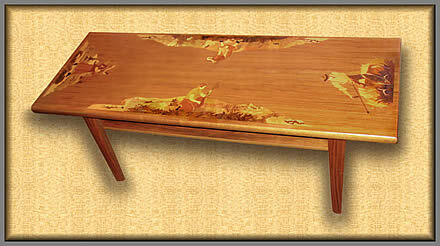 We have a rarely seen rectangular coffee table depicting the four seasons that you will find interesting. Some high quality photos of two B & G pictures are also seen, as well as a potential "B & G style" of picture that may or may not be a true B & G piece - perhaps you may know the answer! 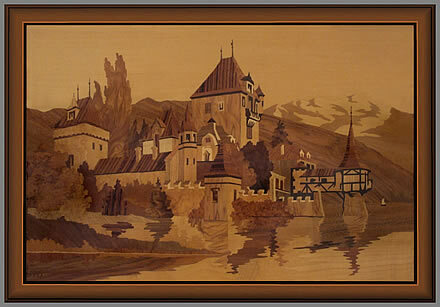 September's updates show some rather interesting examples of Buchschmid and Gretaux wood inlaid pictures and applied furniture pieces. The first example you see here is an unusual rectangular coffee table from the Buchschmid and Gretaux studios. This superbly kept example of its genre is owned by Hank Tosh and still looks as good as the day that it left the Buchschmid and Gretaux's craftsman's hands. 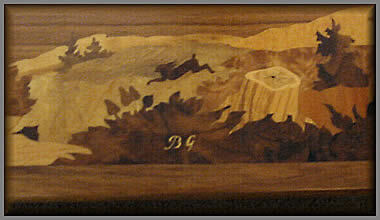 The design on this coffee table displays the four seasons in a rural and agricultural series of settings. Oddly enough, this is the first rectangular example of a Buchschmid and Gretaux coffee table that we have seen. We suspect that Buchschmid and Gretaux must have made more tables in this same format, but so far, this is the only example that we have seen, or has been sent into us. If you think you may have an unusual Buchschmid and Gretaux piece, then why not take a photo of it and e-mail a copy onto us. If it is an interesting one like Hanks' we will probably display it on these pages for other Buchschmid and Gretaux collectors to study and enjoy. 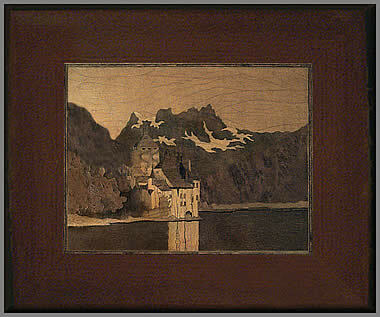 Our next examples of Buchschmid and Gretaux work are of their beautifully executed large pictures of the Germanic countryside and trully atmospheric Gothic castles. These pictures are owned by David Eckersley and we have to say that the photographs David has supplied us with are wonderfully detailed. "You ask about multiple copies of B & G pictures. Yes indeed, they did in fact produce their pictures in multiples of (we estimate) ten from each set of templates they produced. The way they produced their pictures was by making a line drawing of the design and then replicating that. These duplicated drawings were then cut into pieces relative to each piece of veneer required in the picture. Each piece of drawing was then stuck on top of a pack (ten) of veneers of the correct color and graining - the pack was then taped together and the veneers were cut out with a fret saw following the design stuck on top of the pack. This process was followed for each piece of veneer required to make up the complete picture. The pictures were then assembled rather in the manner of a jig saw puzzle - although in this case each part of the picture was numbered with the veneer pieces corresponding to a key on the master drawing, so their process was thus made that much simpler. From the above basic description, it will be seen that once the design had been conceived and a template drawn, a number of copies of a design could then be produced. The high quality of the work, and the obviously finite amount of pictures produced by B & G virtually guarantees their ultimate collectivity and increasing market value." 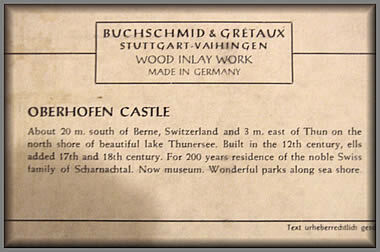 In a general sense the above information should apply to most of the Buchschmid and Gretaux work, although there are always the exceptions to the rule, and some works will therefore not be as collectable as other ones. It is all down to the collectors market values on the day, which is the true guide to the value of any work. But, never forget that, whatever the financial value these works eventually acrue, they are nonetheless, wonderful examples of their genre. 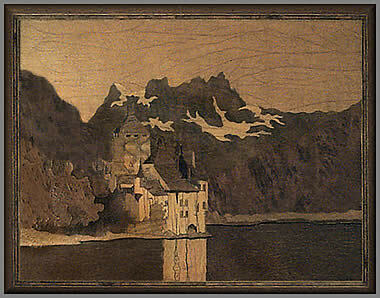 The next set of pictures we bring you belong to Maxwell Langdon and are a representation of the Castle Chillon on the shores of Lake Geneva. 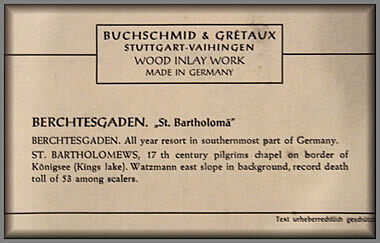 The picture and the label on the reverse look as if they could potentially be a product of the Buchschmid and Gretaux studios, but, from a comparative check against known Buchschmid and Gretaux works, we are inclined to err on the side of doubt. There is a definite display of the craquelure effect showing on the varnish of this picture. Normally this effect is not over obvious on most Buchschmid and Gretaux pictures, but if they have been stored or displayed in comparatively hot or arid conditions, then it is quite possible for this condition to become evident and it is fairly recognizable in the displayed picture. As previously stated, it is best (value wise) to leave the craquelure "as seen" - if you try to 'repair' it you could easily run the risk of significantly devaluing the worth of your Buchschmid and Gretaux piece. We have the impression that this picture could have been made from a kit, but the description on the label seen on the reverse of the picture rather points to it being from a commercial source. Perhaps this commercial source could be a supplier of kit pictures. It certainly gives that impression, but it's difficult to give a definitive answer to this one. If any of you have a similar picture, and know the source of it, perhaps you would like to get in touch and help us update our knowledge base, we would be very obliged to you. On the back of the picture there should be a label saying "Wood produced by House of Constantine" and "Craftsmanship by Skilled American Artists." There's a list of the woods used, with their country of origin, and a number code for each. It may be that your Chillon pictures are from the House of Constantine, too. Click the above button to return to page 11 of "Can You Help"
Click the above button to visit page 13 of "Can You Help"